This haunting, slightly exotic ballad is classic Gigi. The two original Gryce recordings have largely different personnel, and as such are interpreted in different ways. Melody/Solo Transcription editions are available for each Gryce version. The lead sheets are good for all three recordings, and Minus You audio tracks from jazzleadsheets.com's Gryce Project recording are also available, along with an exclusive complete track featuring Bobby Porcelli and Ralph Moore. Our audio excerpt starts with the melody, but the intro from the recording is notated in each edition. Our lead sheets come from Gigi's manuscript, so the basic melody is clearly notated and is the same on all versions of the lead sheets. Personal interpretation is the name of the game in ballad playing, so we have created Transcribed Melody/Solo editions which contain all the nuances played by the two horn players. In this way, you get the complete perspective of both artists as they interpret and solo. Then you can compare this performance with the other Gigi recording (with Art Farmer here, click on the second album cover above for the version with Donald Byrd). Though the title suggests a relationship with Dizzy Gillespie's A Night In Tunisia, the two songs do not have much in common. This one is a minor-key ballad, with a classic hard bop-style melody. The form is unusual: the first A section is 10 measures long, and the second A and C are 14 measures, making the B section the only 8-measure phrase. The changes take an unexpected turn in the seventh measure, going to B minor instead of the expected C7 but then resolving in a series of descending II-V7s with D♭ major substituted for G. The four extra measures in the second A section (and C) are a tag with a simple, repeating melodic line; the final resolution is to F major instead of minor, as in Thelonious Monk's 'Round Midnight. The bridge modulates in different ways to E, D, and D♭. Our audio excerpt starts with the melody, but the intro from the recording is notated in each Melody/Solo Transcription edition. The four-measure intro features an ascending and descending melodic line on a scale similar to F harmonic minor, but with mostly B♮l instead of B♭—a classic "North African" or "Middle Eastern" tonality. The underlying chords are simple open 5ths (notated as, for example, Cop5). After the head there is a short interlude [clip] related to the intro. In the two featured Gryce recordings the trumpet plays the melody for the intro and first half of the head, improvising on the second A section. The alto sax takes over at the bridge [clip], again improvising most of the C section; there is a piano solo for the two A sections after the interlude. The trumpet plays the melody on the second bridge, and the alto on the last C section until the coda, which is slightly different in the two versions. In this one, the same chord is played for the last two melody notes. This first version also has the intro played faster than the head. There are horn backgrounds for the piano solo, which are not played in the later recording. A transcription of Gigi's and Art Farmer's playing on this recording (Melody/Solo Transcription) is available for all instruments; click on the Solos tab for more details. This was the third and last quintet session with Farmer and Gryce that featured mostly Gigi's compositions; also from this session are Sans Souci, Satellite, Nica's Tempo and Shabozz.This song and Satellite were also recorded two years later on a Donald Byrd session; click on the second album cover for more information. The original album title was "Art Farmer Quintet Featuring Gigi Gryce," but it was reissued in 1962 as Farmer's "Evening In Casablanca." The Melody Transcription contains everything played by Art Farmer and Gigi Gryce on this recording. Art plays the melody for the intro and first A section, improvising on the second A section. In this section he alludes to the melody in the seventh, eighth, eleventh and twelfth measures. Gigi also begins with the melody, for the bridge, and improvises the entire C section. Art again stays close to the melody for most of the bridge out, but takes off in a different direction on the last three measures; Gigi's last C section is also considerably embellished. The "pads" with which the two horn players accompany each other (on the first A section, bridge, and last C section) are also included. Throughout, Gigi follows the mood set by Art's mellow tone and laid-back phrasing. Both original recordings of this composition as well as Art Farmer and Gigi's recording of The Infant's Song are unique and intriguing explorations. The two horns trade playing the melody in this beautiful ballad; we've made melody/solo transcriptions available for C, B-flat and E-flat instruments for both featured Gryce recordings. The Gryce/Donald Byrd transcription is available here; click on the first album cover above for Gryce/Art Farmer. A wonderful opportunity to analyze the performances of these great artists, both Gryce and Art Farmer, and Gryce and Donald Byrd. This version is slightly faster than the original, but the intro is slower. The arrangement is also slightly different: the melody line of the intro is more direct, there is a harmony part for the tag on the second A section, and the piano solo lacks horn backgrounds. Gryce again takes the bridge [clip]. The coda ends with two different chords for the last two melody notes: F♯ minor for the B♮l, and F major for the C. Again, there is a melody transcription showing the lines played by each horn player: click on the Solos tab for more details. As noted in the description for the first recording, the melody on the lead sheets is the same for all versions. "Modern Jazz Perspective" was the last of five albums featuring Gryce and Donald Byrd in a quintet setting. The other quintet songs on this album are Gigi's Satellite and Social Call; the rest of the album features the quintet accompanying vocalist Jackie Paris, as well as two songs with a "Birth Of The Cool" instrumentation with the same quintet augmented by Jimmy Cleveland on trombone, Julius Watkins on French horn, Don Butterfield on tuba, and Sahib Shihab on baritone sax. The very first Byrd/Gryce "Jazz Lab" album, also on Columbia from February 1957, featured almost the same quintet and nonet personnels except with Benny Powell on trombone on three tracks, and pianists Tommy Flanagan and Wade Legge. The format of this recording is essentially the same as on the original Art Farmer version, but Donald Byrd's more brash, flamboyant style, along with the more swinging, percussive piano playing of Wynton Kelly, gives it a very different feeling. This also affects Gryce, who embellishes more freely both on the melody and the "pads". Unlike Farmer, Byrd plays the melody for the last four measures of the second A section. 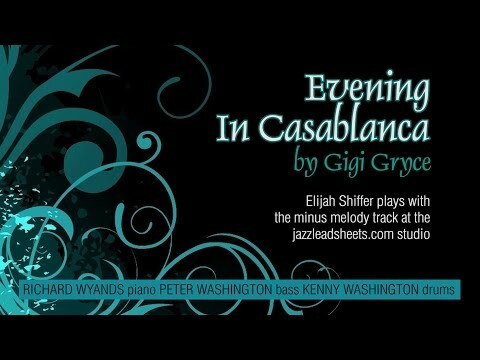 This is one of the two gorgeous Gryce ballads that we picked to record on "The Gigi Gryce Project", the other being The Infant's Song, which features Ralph Moore as soloist. Evening In Casablanca features Bobby Porcelli as soloist. Gigi's original recordings of both of these ballads featured melody and soloing interplay between two horns, and they're are fascinating to study. Check out each listing: melody/solo transcriptions of the original artists are available. This ballad is truly one of Gigi's most beautiful compositions and it's one of my all time favorite ballads. As such, I like to play it without Gigi's introduction or interlude, and that's the way it's performed on this recording. It's simpler than the Art Farmer and Donald Byrd versions. There is an improvised solo piano intro instead of the arranged introduction heard on the other two recordings. The melody is played all the way through the first chorus (like the other versions, there are two choruses); in this case, the alto sax takes the A and C sections while the tenor has the melody on the bridge. Except for the first A section, the horn that is not playing the melody is playing "pads" as in the original arrangement; this second part is not indicated in the lead sheet but appears in the Melody/Solo Transcriptions for the other two recordings. There is also no interlude here; the alto solos for the first half of the second chorus, and the head is taken out from the bridge the same way, with the same coda as on the Donald Byrd version. The melody is shown in the lead sheets (editions for all instruments). Minus You tracks are available for melody instruments to play along with; click on the Minus You tab for more details. See other titles on The Gigi Gryce Project. For three days in the late summer of 1999, the Van Gelder Recording Studio was filled with Gigi Gryce music. Over the coming months we'll be posting all the great titles that were recorded during that time. Engineer Rudy Van Gelder recorded many of the original versions of Gigi's titles; it was a pleasure for him to hear them again, this time in his Englewood Cliffs studio. Gigi's original recordings were made in Rudy's Hackensack, New Jersey, studio, in the living room of his parents' house at 25 Prospect Avenue. An opportunity to interpret this beautiful melody, accompanied by pianist Richard Wyands and Peter and Kenny Washington. The Minus Melody track [[clip] does not have a count-off. Instead, there is a rubato solo piano introduction; when the piano cuts off, this is the cue to begin the melody pickup.